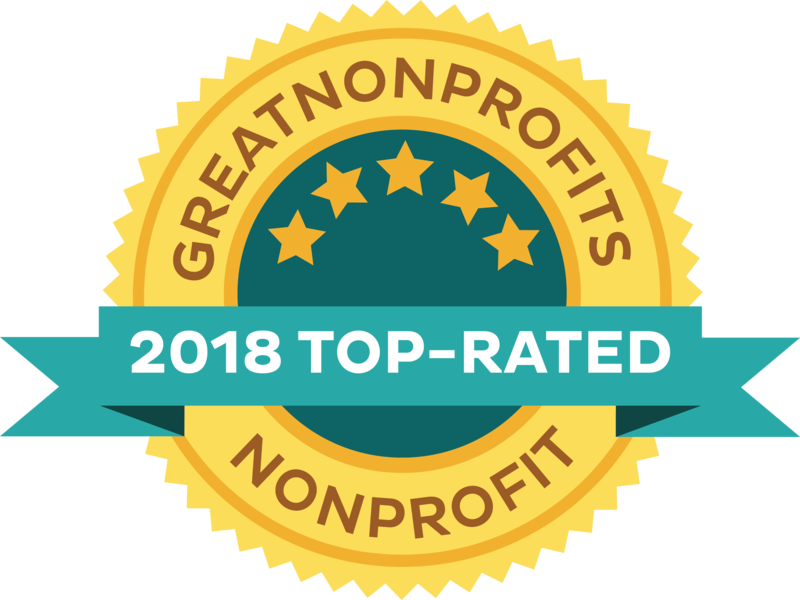 The barn at LifeCamp set the tone to celebrate the many corporate teams and community groups that support our programs with a display of their colorful t-shirts and creative service day logos. Thanks to local merchants and AGAR supporters, our Farm to Fork raffle baskets and silent auction featured over 50 generous prize packages. During our opening reception, guests enjoyed a wine and craft beer tasting sponsored by Michael and Yong Cedro of Riverside Wines & Liquors along with samples of amazing artisan foods from Bobolink, Booker & Zinc, Croton Farmers’ Cooperative, Fulper Family Farmstead, Metropolitan Seafood & Gourmet, and the Oldwick Soup Company. We would like to extend a big thanks to our vendors and to the amazing crew of volunteers that kept the event flowing smoothly from start to finish. Our speaking program featured our President & Founder: Chip Paillex, Special Guest Speaker: Katie Sapio, our Special Honoree: Kathy Cree of LifeCamp, and AGAR Board Chair: Jackie Etter. Finally, guests dined on a delicious farm-to-table meal prepared by Ross & Owren Fine Catering and enjoyed sweet treats from Abe’s Muffins, The Dessert Plate of Somerville, and Sweet Spot Bake Shoppe of Chester served with a cup of artisan roasted organic coffee from Black River Roasters. 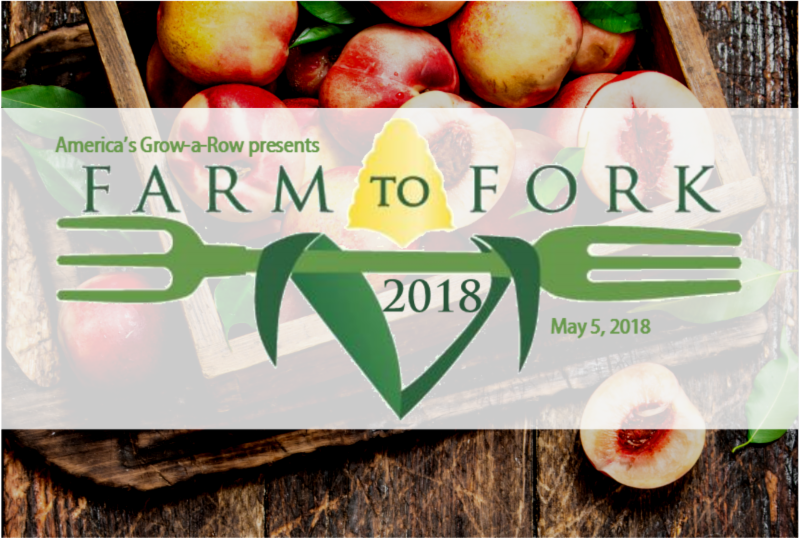 We are pleased to announce that Farm to Fork raised nearly $110k for America’s Grow-a-Row! Want to help that number grow? 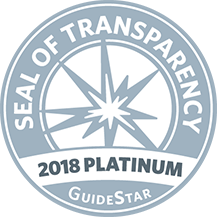 To double the impact of your gift to America’s Grow-a-Row, CLICK HERE to see if your company will match your donation. 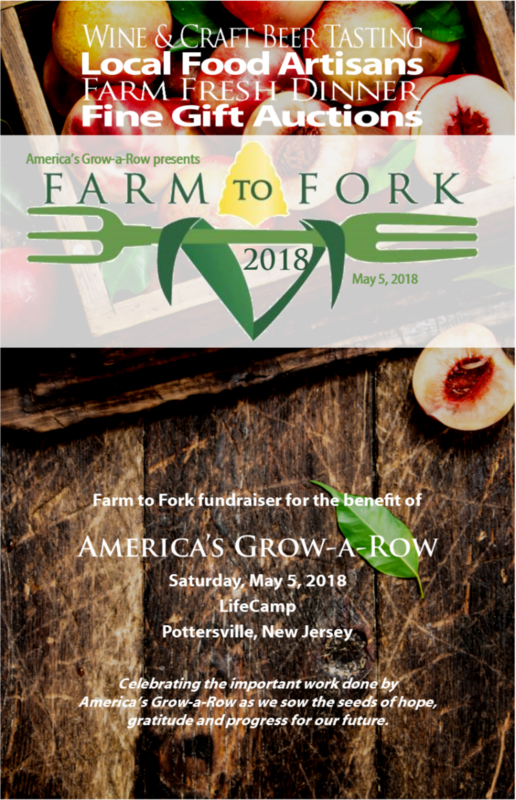 Proceeds raised at the event will help America’s Grow-a-Row build on our exciting 2017 accomplishments of donating over 1.5 million pounds of farm-fresh food to various hunger relief agencies in New Jersey, New York City, and eastern Pennsylvania while at the same time educating people of all ages about hunger, the importance of agriculture, and healthy eating. 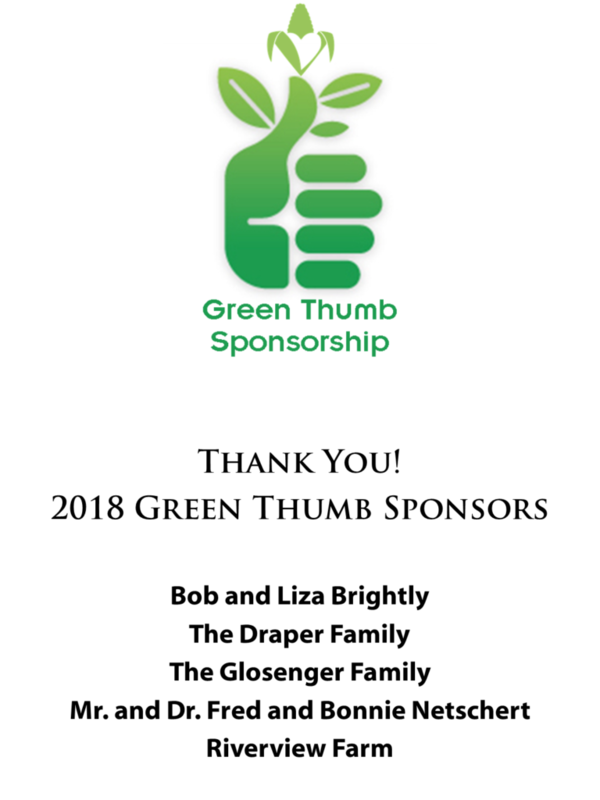 Green Thumb Sponsors and Advertisers!